Ines G. Županov and Pierre-Antoine Fabre have edited a new collection of essays that examines the “debates concerning the nature of “rites” raging in intellectual circles of Europe, Asia and America in the seventeenth and eighteenth centuries,” according to Brill Publishers. The Rites Controversies in the Early Modern World consists of fourteen articles, tracing a controversy that began with the practices of accommodation in the Jesuit missions of Asia. 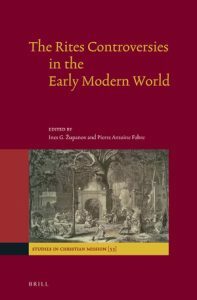 Contributors to this volume, in addition to Županov and Fabre, include: Claudia Brosseder; Michela Catto; Gita Dharampal-Frick; Ana Carolina Hosne; Ronnie Po-Chia Hsia; Giuseppe Marcocci; Ovidiu Olar; Sabina Pavone; István Perczel; Nicholas Standaert; Margherita Trento; and Guillermo Wilde. More information is available at https://brill.com/view/title/34019.